Marsh Blue Club join forces with Huddersfield Live to bring you Battle of the Bands. A pre-festival fundraiser with Huddersfield Live to boost fundraising efforts for The Welcome Centre. Marshfest organisers are hosting Battle of the Bands. A pre-festival fundraiser with Huddersfield Live to boost fundraising efforts for The Welcome Centre. 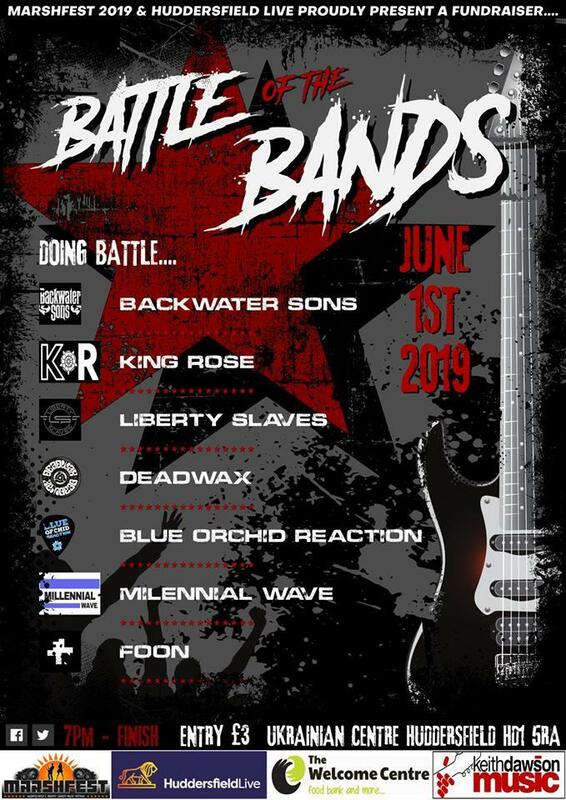 Battle of the Bands will take place on 1st June at Huddersfield Ukrainian Club, where seven local original bands will battle it out to win first prize. An opportunity to perform live during Huddersfield Food and Drink Festival 2019, run by Huddersfield Live. Bands that have entered will be judged by a panel consisting of members from Marsh Blues Club, Sam Watt from Huddersfield Live and Emma Greenough from The Welcome Centre. Tickets will cost £3 on the door and all friends, family and supporters are encouraged to come along and support the event. A great opportunity to hear what fresh talent is up and coming in the area. All money raised from the Battle of the Bands will go towards the final total from Marshfest. It will help cover any of the festival costs, to ensure that as much of the money made goes directly to support the people who need it. This year’s Marshfest is more important than ever with The Welcome Centre experiencing a 37% increase in demand for its services in the last 12months. Marshfest 2019 takes place on the evening of 19th July and all of Saturday 20th. It will see bands such as The Exiled Stones, The Killermeters, Highway 62 and Boo Sutcliffe perform across the two days. The family festival will keep its price at £5 with kids going free, so that it is accessible to all. All performers taking part will do so for free, with many appearing for the 2nd or 3rd year running. Huddersfield Food and Drink festival takes place between 1st and 4th August at St George’s Square. It promises to bring you the best of food and drink from the region, alongside great music and performances. Visithttps://www.facebook.com/huddersfieldlive/for more information.